Purples are cool yet quietly passionate. This includes African Violet 16-3520, a spring 2013 designer color created by the Pantone Corporation. Shades in the blue and purple color range are tranquil and soothing yet commanding, because they calm the garden. Cornell University says that blues and purples 'recede in the landscape' seeming farther away than they are. If you have a garden bed that is in your face with bright reds, oranges and yellows, one way to cool it down is to add Salvias and companion plants from the blue to purple palatte. Here are 15 choices from our catalog that fashionably match Pantone's African Violet. We've roughly organized them by size based on potential maximum height. Plants that may vary in height from 2 to 4 feet tall are in the 'medium' group whereas ones that will rise up at least 4 feet are in the 'tall' group along with a sage that spans heights from 2 to 5 feet. Azure Mountain Sage (Salvia microphylla 'Mesa Azure') Zones 7 to 9. This heat-tolerant, hummingbird favorite likes regular watering, but does well in dry gardens. It works well in borders and containers, edging pathways or as groundcover. Blue Turkish Sage (Salvia cyanescens) Zones 6 to 9. An ethereal bicolor combination of pink and violet, the blossoms of this Turkish native are large compared to the plant's height. Due to its heat and drought resistance, it works well in rock gardens and borders as well as on slopes. Bicolor Szechuan Sage (Salvia sp. from Szechuan) Zones 4 to 9. Handsome foliage and the delicate bicolored combination of violet and pale yellow marked with violet beelines make this one of our most popular shade choices. This Salvia with no name likely is a hybrid. 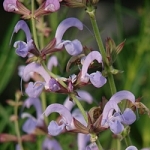 Himalayan or Kashmir Sage (Salvia hians 'Super Elk Strain') Zones 6 to 9. Rich soil and plenty of water are good conditions for this Asian sage, which grows in woodlands and on slopes in its homelands. This is a pretty solution for moist areas in your yard. Lilac Sage (Salvia verticillata) Zones 5 to 9. Honeybees and butterflies love the dense whorls of blossoms on this heat-tolerant sage's 3-foot flower spikes. They're lovely as cut flowers. 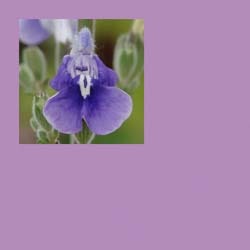 Lilac Sage works well in moist areas and looks pretty along borders and edging paths. Pine Mountain Sage (Salvia semiatrata) Zones 8 to 11. Violet and deep purple blossoms combine with pink bracts to make this one of the showiest sages we sell. Plant this honeybee and hummingbird favorite as a screen or in a shrub border. It also does well in containers. Stem Clasping Violet Sage (Salvia amplexicaulis) Zones 5 to 9. From a distance, the magenta bracts and deep violet flowers of Salvia amplexicaulis blur into a dramatic display of Pantone African Violet. This water-loving sage is a good choice for moist problem areas in your yard. Candelabra Spanish Sage (Salvia candelabrum) Zones 7 to 10. Branching out like a candelabrum, this perennial sage will stay short in a container or grow much taller in ground. It does beautifully in dry gardens where it is attractive in borders and cut flower gardens. Honeybees and butterflies are drawn to it. Cleveland Sage (Salvia clevelandii 'Winnifred Gilman') Zones 8 to 9. Of all our Cleveland Sages, Winnifred Gilman is the one that best matches Pantone African Violet. Cool lavender-gray bracts surround and accentuate its blossoms. Plant it as a screen, in borders and in a cut flower garden. Be ready for lots of honeybees and hummingbirds. Grape Scented Sage (Salvia melissodora) Zones 8 to 11. The flowers as well as the foliage of this shrubby, heat- and drought-tolerant Southwestern sage share a fragrance that wavers between grape and lavender. Although it's average height is about 36 inches, Grape Scented Sage grows up to 72 inches in the wild. Expect lots of hummingbirds, honeybees and butterflies. Sages and companion plants with violet-colored blossoms mix well with a broad range of shades in the blue spectrum from pale sky blues to royal 'true' blues. Flowers by the Sea offers scores of blue and purple selections. If you need any advice about choices for your flowerbeds, please call or write. We enjoy sharing ideas about how to heat up or cool down gardens. It's our passion. Always healthy, great looking plants when I unpack them. Really appreciate the huge selection of unusual plants that have become so hard to find. Thanks you FBTS! Everything arrived healthy. I like that the long blades of my kniphofia were wrapped in paper to protect them. The prices are good, so that even with the cost of shipping them across the country it was a little cheaper than some other places. I just love the Divine Sages from FBTS - great quality and prince. The Luna variety is my favorite and I have just ordered my second one! Thank you for carrying this amazing entheogen from the Salvia family. I recently bought 5 salvias in two varieties. I was impressed on how quickly they came and how carefully packaged they were. I cant wait to watch them mature, and will defiantly be buying more from you in the future! Thanks! I have ordered twice now from Flowers by the Sea. Both times the plants have been some of the best I have ever received by mail order and I have used several vendors. I like to attach hummingbirds to the garden and have never a selection that had so many choices.